These "Airless Confetti Launchers" are REVOLUTIONARY in the Confetti Industry! 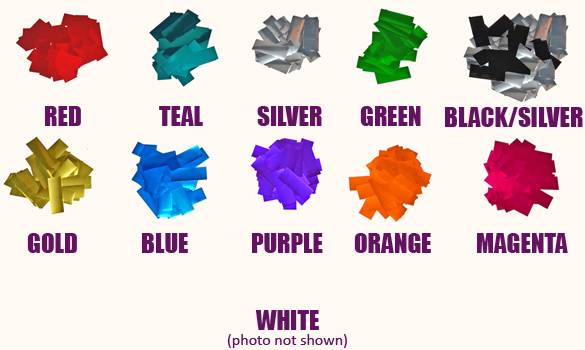 We can custom color our Metallic Confetti Strips to coordinate with the theme of your event. They are so unique, we received a U.S. Patent on them. What makes them so unusual is generally you need a Co2 confetti launcher to shoot streamers into the air, but these will fly out of the tube 25' to 30' high WITHOUT USING Co2. You simply hold the confetti tube in your hand, and then raise your arm straight up into the air. With the simple "flick of the wrist," watch the confetti products fly high into the air giving a glamorous special effect. Turn the tube over and flick again, for their are 2 shots in each tube. These Airless Confetti Launchers filled with Confetti Strips can be shot horizontally for use in low ceiling facilities. They create a "Memorable Moment" at any event! The Metallic Confetti Strips are made from flame-retardant PVC film. If you want neon "Glow in the Dark" please contact us for pricing. Click the button below to add the 18" Airless Confetti Launcher with Metallic Confetti Strips (Custom Colors) to your wish list.